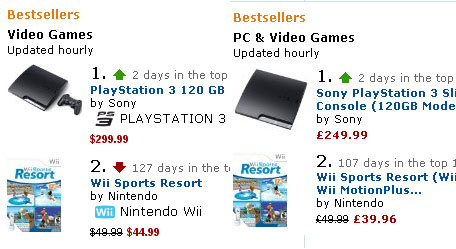 The Playstation 3 Slim Is Currently The Best Seller For Amazon UK & USA. The system currently sits aloft both the British and American Amazon video game best sellers lists, while it charts highly on the French and German versions of the website. This can only be good, early signs for Sony, who have clearly succeeded in building up the hype for the latest Playstation system. If you don't have a Playstation 3 yet, it's probably a great time to get one.